Drambuie 15 is a connoisseur expression of Drambuie drawn from the Company's finest selection of 15 Year Old Speyside Malts. Selected for their soft complex fragrance and flavour, the rare Speyside Malts ideally complement and balance the herbs and spicy aromas of Drambuie's famed secret recipe. 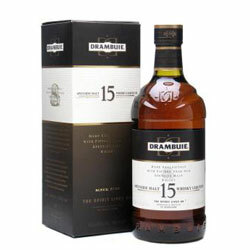 With a nose of Drambuie's aromatic citrus spice, fragrant grass and butterscotch notes, Drambuie 15 has a velvet soft mouthfeel with a tang of lemongrass and warming malty notes, berries and heather. A finish of shortbread, fresh herbs and the unmistakable long afterglow of the Drambuie elixir results in a refined, drier expression, perfect for sipping and savouring either neat or over ice.